Jim Hoeppner’s Colorado and Great Western is a multilevel freelanced HO layout based on the DRGW railroadset in the 1970s era. All place names on the layout are actual stations on the DRGW but there is noattempt to accurately model any of the locations. The layout fills a 22 by 33 foot basementwith the upper level going over the entrance door to avoid any duckunders. 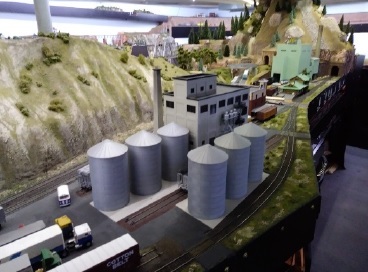 Thescenery is 100% complete andhas manywell detailed scenes to see.There is fullyfunctional CTC signaling system installed controlled by CMRI hardware and JMRI. For a video of Jim Hoeppner’s Colorado & Great Western and Gary Petersen’s Salt Lake Southern click here. For more detailed information on Jim’s Colorado & Great Western click here.